From today I will include a new weekly food/diet update on my blog. It is called "Menu Mondays" and it basically shows you everything I eat on Monday. I want to start sharing this information to start my week in a healthy way and also because I know a lot of people like to see what others eat (at least I do)! Monday is often recommended as the day to start a new diet. It is the beginning of a new week and often feels like a fresh start, like you can forget all the mojitos, pizza and croissants you had in the weekend. Good intentions are very present and new beginnings are always exciting and motivating. Personally I feel like this little tric works very well for me. If I make it through Monday healthy, diet and exercise wise, I am motivated to hold on for the rest of the week. If I don't start off my week in a good way (snacking on chips, cookies and chocolate) I will be saying on Tuesday: "Oh well, let's just start over next week, yesterday was a disaster anyway". Does anyone know what I mean? This is why I came up with "Menu Mondays". I think it will be motivating for myself to eat healthy because of the audience... And I promise I won't be cheating and I will show you guys everything that passed my mouth! Lastly, I am not a dietitian and I don't want to pretend I eat all the perfect foods, I just want to inspire you to start off the week healthy so you might too get a better and healthier start of your week. I also drank 1,5 liters of water and 1 can of Coca Cola Zero. I try to maintain a nutritious diet through out the week and not to indulge too much. I always try to eat 3 meals and 1 snack, this way I never feel like I'm starving (which leads to binge eating). 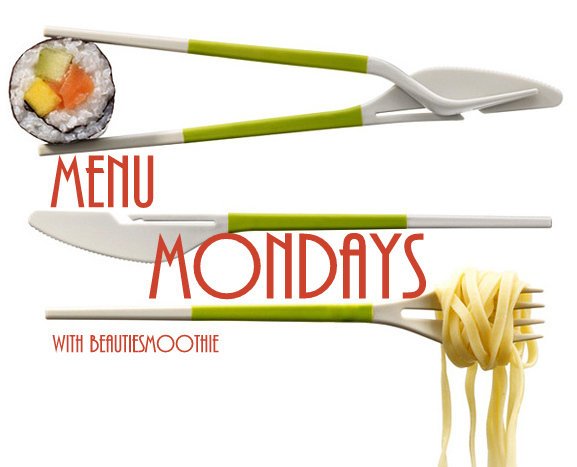 I hope you will find the future "Menu Mondays" posts interesting!